Learning a new language can be a challenging process, and when your users are mainly from a non-English speaking geographical location and your control panel is in English, this can often be more confusing and complicated than needed. This is why Installatron can now be translated manually or automatically into almost any language that you’ll ever use. The beauty of using an auto-installer like Installatron that allows you multi-language support is that you can really broaden the amount of customers that your business can appeal to. By purchasing an Installatron license, you will have full access to the most flexible auto-installer on the market, and you will also be able to allow your users to view your site in any number of different languages. How does Installatron Compare to Fantastico? Since there are so many auto installer programs on the market, you may be wondering what the difference is between an Installatron license and a Fantastico license. Both of these programs offer you the ability to integrate new web applications into your virtual environment very simply, but there are a few differences to take note of. 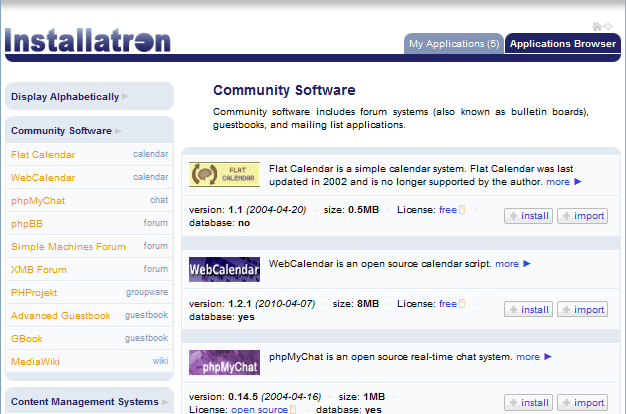 For one, Installatron has the fastest update process available and an official set of applications and installers. These can be enabled and updated automatically. An Installatron license will also allow you to keep your installations secure and up-to-date. While Fantastico allows you to install many popular applications, Installatron makes the installation process much easier, and the program can automatically filter versions that are incompatible with your system. Installatron allows administrators, hosting providers, and users to restore and create different backups and snapshots depending on their needs, and you can also create unique and customized application installers directly from Installatron. An Installatron license offers much more than that as it will also allow you to reduce your costs, and since there are so many excellent licensing options, an Installatron license will fit into any budget. There are also no additional fees with Installatron like there are with other auto installer programs on the market. With a Fantastico license, you will still be able to install great applications with adaptable features, but your options will be more limited. Installatron allows users to import applications directly from other existing programs like Fantastico or Plesk, and this can be extremely beneficial if you have tried these other programs and like some of the applications that they offer. In contrast to a Fantastico license, an Installatron license will allow you to integrate with multiple control panels, making it extremely versatile. If you choose to change to a different control panel, then you will not have to purchase another auto-installer like a Fantastico license; you can take Installatron with you! Auto-installers can generally be used on only a certain number of Operating Systems, control panels, and other programs. For a first time user or even a seasoned user, Installatron eliminates that problem because Installatron can run on any control panel, on any operating system without being limited to any specific auto-installable application. This is extremely helpful for users that need versatility from their auto-installer, and since you can know that without a doubt, your control panel will work with Installatron, you won’t have to waste time looking at products that you simply can’t use. When you purchase an Installatron license, you have the freedom to do what you need to do without being tied down to a certain control panel. You can even make your own applications and have them instantly installed with a single click. Licensing Installatron not only makes it simple to operate the program, but also you can add applications and scripts in a flash with ease. Installatron really does make things easy and straightforward for everyone including the end-user, which undoubtedly to most businesses is the most important one. 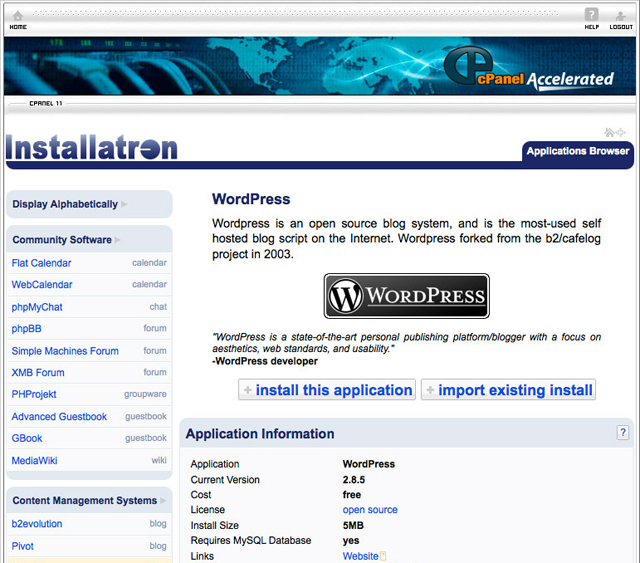 Installatron, with its diverse set of features and rich list of applications available, is a dream for any control panel user, and an Installatron license will allow you to take full advantage of the benefits to using an auto-installer that is versatile enough to be used on different control panels and operating systems. Since most auto-installers are so limited in their scope, an Installatron license will give you the edge that you have been looking for so that you can take your business to the next level with exciting, engaging applications and adaptable functionality. You can purchase an Installatron license on a trial basis, so that you can play with the features and begin to understand the customization options and flexibility of the program.